On 17-year-old Kate's last weekend in town before heading to college, she and her geeky friends head to SpaceCON, the local sci-fi convention. There Kate meets Paul, a recently turned teen vampire. When Kate tries to make a move on him, he bites her in the neck. Soon Kate and her friends discover that Paul is not the only vampire at the convention, and it is now up to them to stop the undead and find a way to save Kate before she too turns. The third feature written and directed by 18-year-old phenomenon Emily Hagins, My Sucky Teen Romance is a smartly comic take on the horrors of adolescence. Will the trend of teen vampire movies ever subside? Yeah, I guess, but it shows few signs of petering out so far. 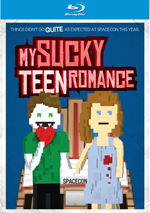 2011’s My Sucky Teen Romance provides a quirky take on the genre. A prologue in 1958 introduces us to Vince (Devin Bonnee), a biker dude who feels bad for Gina (Tina Rodriguez), a babe who gets jilted by her date. His good deed quickly goes punished, as she turns out to be a vampire and she bites him on the neck. With that we leap to modern day and meet some teens about to enter college. They agree to go to a sci-fi convention called SpaceCON one last time before Kate (Elaine Hurt) goes out of state. Kate has a crush on Paul (Patrick Delgado), a clerk at a local grocery store. He encounters a bump in his personal road when Vince enters the business and bites both Paul and his co-worker Cindy (Lauren Vunderink). This immediately transforms the two of them into the undead. Paul and Kate develop their burgeoning relationship at the con, though Paul can’t decide if he wants to kiss Kate or bite her. He resists the urge to transform her but accidentally chomps her neck anyway, so Kate soon joins the ranks of the vampires. She and her friends attempt to alter this circumstance. The trailer announces that Sucky comes from “teen sensation” writer/director Emily Hagins. While the “sensation” part remains up for debate, one can’t argue the “teen” claim, as Hagins was only 18 when she made the film. That creates an unusual twist, as Sucky offers a teen movie actually created by a teenager. As a flick from someone still high school age, Sucky is pretty awesome. It’s hard to imagine many 18-year-olds delivering a movie as complete and self-assured as this one. But if we eliminate the age gimmick from the situation, does Sucky stand on its own? Yeah, to a degree, but not as well. The flick seems impressive as a feature from someone so young, but objectively, it’s a pretty spotty movie. Pacing becomes a major problem, especially in the first half. The movie develops at a sluggish rate and doesn’t use its time well. Rather than expand the characters, the flick just meanders along, and the tendency gets worse at the SpaceCON, where it feels like Hagins just filmed the convention activities and left it at that; the story gets bogged down in superfluous material. A 77-minute movie should move briskly and shouldn’t feel padded. Sucky also suffers from an almost inevitable sense of amateurishness, especially in terms of its actors. From top to bottom, the performers lack much polish or believability. While I can’t claim any of them are truly awful, I also can’t find a single one who delivers a convincing, interesting performance; they all lack quality as professionals. Hagins also isn’t quite “there” yet as a professional filmmaker. Of course, she’s much closer than a teenager has any right to be, and I suspect she’s hamstrung by the film’s low budget, but I still think she needs more seasoning to get to “the big leagues”. Sucky too often feels like a student film – a pretty accomplished student film, but a student film nonetheless. Sucky does show signs of life in its second half. I like the segments in which the kids test Kate’s vampire qualities, and it threatens to become downright dramatic toward the climax. Alas, it can’t do more than tease us in the end. I admire the potential talent Hagins shows here and think she’ll develop into a skilled filmmaker in time. Sucky doesn’t display a mature director, however; it’s an occasionally entertaining movie but not one that satisfies on a consistent basis. My Sucky Teen Romance appears in an aspect ratio of approximately 1.78:1 on this Blu-Ray Disc. The image showed good reproduction but lacked great clarity. For the most part, sharpness seemed positive. While the movie didn’t provide excellent definition, it appeared acceptable concise and accurate. No issues with jagged edges or moiré effects occur, and I noticed no edge haloes or noise problems. Source flaws also failed to pop up here. Unlike most films of its genre, Sucky delivered a natural palette. Skin tones could be a little orange at times, but I suspect that occurred due to makeup issues; otherwise the colors appeared pretty full and rich. Blacks showed good depth, and shadows offered nice delineation. This wasn’t a killer presentation, but it seemed worthy of a “B”. It comes as a surprise that Sucky only provides a PCM Stereo soundtrack; that’s unusual for a modern movie, even one with a small budget. The soundscape didn’t have much to offer. Music showed decent but unspectacular stereo imaging, and effects occasionally broadened to the side speakers. However, the track remained largely monaural, without a lot of spread most of the time. Audio quality was acceptable. Speech remained intelligible and natural, though some awkward looping popped up at times. Music was fairly full and dynamic, and effects showed reasonable accuracy. Bass response was pretty deep, though low-end could be a bit too heavy on occasion. This was a decent track but not one that fits with modern standards. A few extras fill out the set. We launch with an audio commentary from writer/director Emily Hagins and producer Paul Gandersman. Both sit together for this running, screen-specific look at script/story/characters, sets and locations, cast and performances, effects and editing, music and audio, costumes and visual design, and a few other production areas. Hagins and Gandersman provide a competent commentary. At no point does it threaten to become truly engaging, but it always manages to stay on task and give us good details about the production. That makes it a worthwhile listen for fans. We get an 11-minute, eight-second Behind the Scenes Featurette. It includes notes from Hagins, Gandersman, and actors Tony Vespe, Elaine Hurt, Lauren Lee, Santiago Dietche, Patrick Delgado, and Devin Bonnee. We get some notes about Hagins’ career, the film’s story and characters, cast and performances, thoughts about the vampire genre and the movie’s use of gore, Hagins’ take on the material, shooting the convention, camerawork and technology. 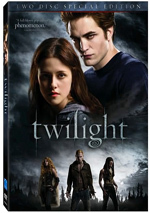 The featurette doesn’t get into much detail, but if offers a decent overview of the production. One Deleted Scene runs two minutes, 51 seconds. It shows more of the vampire panel that features Harry Knowles. It’s completely superfluous in terms of story and lacks much entertainment value; it’s amateurish and unfunny. Next comes a short film from 2011 called Cupcakes. It goes for two minutes, five seconds, as it shows a super-perky couple who cheerfully bicker as they order snacks at a cupcake shop. Hagins directed it and it features a couple of actors from Sucky. It’s not particularly memorable, but it’s okay. A Blooper Reel goes for one minute, 54 seconds. This mostly consists of actors acting silly on the set. It’s probably a lot of fun for them to revisit, but it’s not very interesting for the viewer. The disc opens with ads for A Bag of Hammers and Hypothermia. We also get the trailer for Sucky. A teen vampire movie directed by a teenager offers an interesting twist, but does it ensure a good film? No. My Sucky Teen Romance isn’t a bad flick, but it can be amateurish and doesn’t satisfy on a consistent basis. The Blu-ray provides good picture, lackluster audio and a few useful supplements. I can’t say I actively disliked Sucky, but I can’t say it does anything for me, either.